Is there a better alternative to TopCalculette Pro? Is TopCalculette Pro really the best app in Mathematics category? 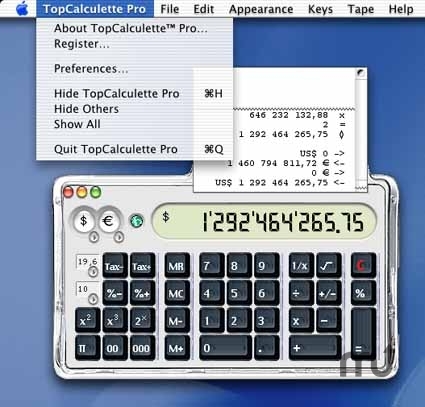 Will TopCalculette Pro work good on macOS 10.13.4? TopCalculette shows the calculations on a virtual paper tape. When minimized, you always have it on hand. By using its 12 useful and customizable keys and it's handy tax and percentage features your daily calculations are simpliflied. 5 new currencies updated from the internet: Tanzanian Shilling (TZS), Malgach Ariary (MGA), Belizian Dollar (BZD), Costarican Colon (CRC) et Cambodian Riel (KHR). Now TopCalculette Pro has now 98 currencies updated from the internet. The Slovak koruna (SKK) has been replaced by the Euro on 01/01/2009. Its exchange rate has been fixed to: 1 EUR = 30,1260 SKK. TopCalculette Pro needs a rating. Be the first to rate this app and get the discussion started! When updating application, TopCalculette ask to rebuild the currencies list. The temporary folder has been deleted from RubenSoft folder and moved to /Library/Caches. The TopCalculette menu of the dock is deleted when erasing the tape (cmd R). The organization of the currencies list has been improved. If you want to apply this improvement to your calculator, select [Calc.>Edit currencies and units...] and then click on the button [Default…]. The update rate on the RubenSoft currencies server is more reliable and accurate. Input of parameters of loan calculator. At launching, the automatic iconization of the application works on Snow Leopard. The version of the application was shown on Snow Leopard.